Insert cards include costume, prop, and autograph cards. Each box contains 2 coins. 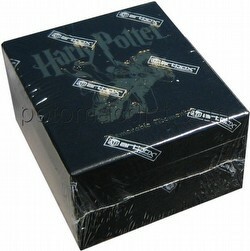 This set includes quotes from all four Harry Potter movies - Harry Potter and the Sorcerer's Stone, Harry Potter and the Chamber of Secrets, Harry Potter and the Prisoner of Azkaban, and Harry Potter and the Goblet of Fire.